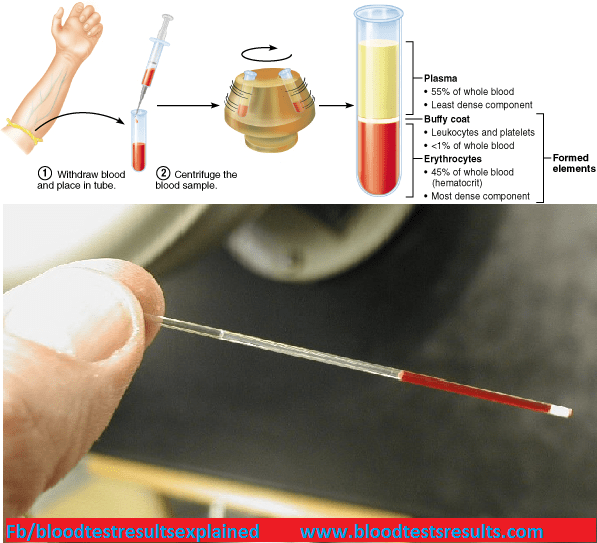 It means, the laboratory phlebotomist drawing a blood sample for complete blood count test, inside the lab, a laboratory technician takes a small fraction of the sample into a capillary tube, centrifuge the tube, after minutes, he screen the separated plasma and red cells which aggregated in the bottom, the length of the red cell packed in the bottom is directly a measure of HCT level. The process means that HCT test or Crit. is a ratio of total red blood cells (only) volume to the total sample volume, when expanding, we can say that hematocrit measures the ratio of RBCs Volume only to total blood volume for a patient. HEMATOCRIT values used indirectly for measuring the relative percentage of fluid portion of the blood. When HCT is high it means low fluid portion and high cellular portion of the blood. Dehydration mainly associated with increased blood proteins which is in turn a result of relative increase of HCT than Plasma, which means low plasma contain the same protein concentration of the normal plasma volume, as the test measured in milligrams of proteins per deciliter of plasma, the protein concentration increased in turn. Many cases are coming for better understanding of HCT and normal or abnormal levels.